We Are Feminist is an accessible and fully-illustrated book that tells the story of the women's movement over the past 150 years. In a fantastic gift format, it's the perfect introduction to modern feminism for anyone who wants to learn more about the history of the women's rights movement. The book looks at how far women have come, celebrating both collective and individual achievements. 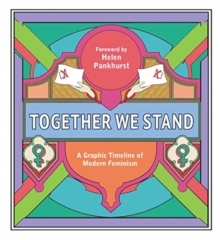 Organised into feminist waves, it tells a visual story through graphically represented statistics, key dates and events, quotes and facts about rights campaigns and the women who inspired them. Easy to dip in and out of, and sure to provide a jolt of empowerment to the next generation of feminists.